Looking to buy Bitcoin with SEPA bank transfer? Coinmama now offers customers in select European markets the option to buy Bitcoin directly with a bank account using SEPA. Coinmama is a simple and safe way to buy Bitcoin with bank transfer, trusted by over 1 million customers in almost 190 countries. Buying Bitcoin with your bank account is easier than ever. Simply register, get approved for purchase, and place your order! Sign up for Coinmama and create your account. Learn more about how to create your account here. For added security, you’ll need to verify your identity to get approved for purchase. Upload your passport or national ID in order to get started. You can read more about our verification process here. 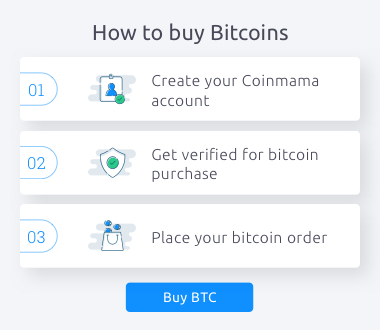 Log into your Coinmama account, select the amount of Bitcoin you’d like to buy, and follow the prompts to enter your wallet address and initiate a SEPA bank transfer. Our step-by-step guide to placing an order can be found here. Buying Bitcoin with a SEPA bank transfer allows for greater purchase amounts and lower fees than buying with credit or debit card. Coinmama currently allows bank transfer purchases of up to 12,000 USD a day, and unlike credit and debit cards, there is no additional processing fee charged by us for bank transfers. SEPA bank transfers are available to customers in most European Union (EU) countries and the United Kingdom (UK). You can find more information on how to create a SEPA order here. Bitcoin is a decentralized peer-to-peer digital currency unit, allowing users to send payments without going through a central authority such as the bank. It’s protected by cryptography, and every transaction is logged on a master ledger called Blockchain, making it virtually tamper-proof. A dedicated team of customer support specialists.